First prize: Dr Sanjay Chotirmall, Respiratory Research Division, RCSI, Beaumont Hospital for his presentation: Estrogen Induces Mucoid Conversion of Pseudomonas aeruginosa and Promotes Infective Exacerbations in Females with Cystic Fibrosis. 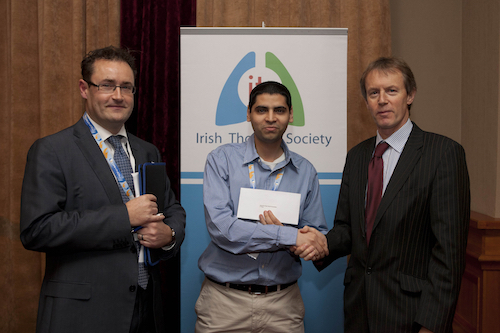 Dr Chotirmall pictured receiving his award from Dr Colin Edwards, General Manager, Boehringer Ingelheim Ireland with Dr Edward McKone, President the Irish Thoracic Society . Second prize: Dr Sarah O’Beirne, St Vincent’s University Hospital and School of Medicine and Medical Science, UCD for her presentation: CXCL9 inhibits Smad2 Phosphorylaiton to abrogate TGF-β signaling in EMT. Dr O’Beirne pictured receiving her award from Dr Colin Edwards, General Manager Behringer Ingelheim Ireland with Dr Edward McKone, President the Irish Thoracic Society.